Sonic the Hedgehog and I go way back. Nintendo was certainly responsible for raising me throughout my toddler years, but right around 1993 my parents made me choose between owning a Super Nintendo and a Sega Genesis. I picked the latter (I don’t really regret my decision because of the Sega Channel service that came around later), and thus was introduced to a few new gaming icons. But as I’ve mentioned previously, I’m a handheld gamer first and a console gamer second. So I want you all to know that I purchased entire gaming consoles just to play Sonic on the go back in the mid-to-late nineties. 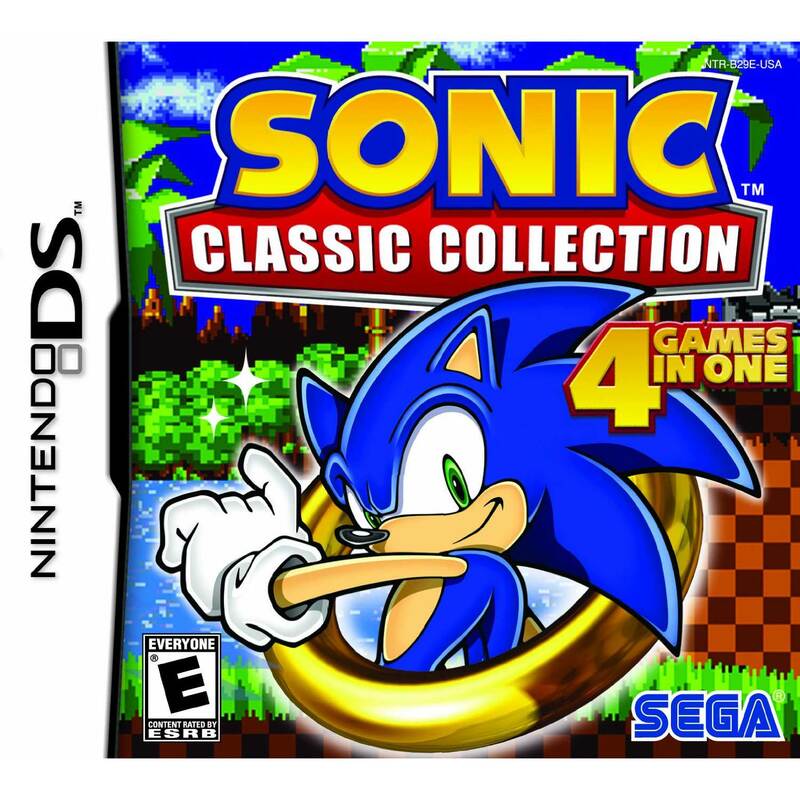 Fast forward to a zillion years later when, after releasing a handful of console-based Sonic Compendiums, Sega finally offers a selection of Sonic’s finest for the Nintendo DS in the form of Sonic Classic Collection. 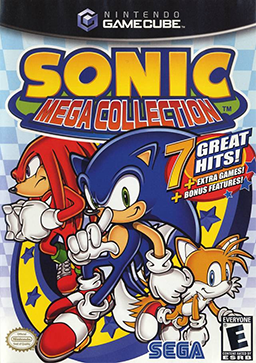 Sonic the Hedgehog, Sonic the Hedgehog 2, Sonic the Hedgehog 3, Sonic & Knuckles and the two lock-on versions of Sonic & Knuckles are included in this collection. To date, I believe this is the only portable Sonic collection that features “S2&K” and S3&K”. I know for a fact, as a diehard fan, this is the first question on everyone’s mind when a new collection is announced. So, there are four games here, technically six if you think about it. And all six of these games would have received perfect scores from me at the time, and probably still hold up today as some of the greatest platformers of all time. But (spoiler alert!) you won’t find a perfect score attached to this review by the time you reach the end. Why, you ask? Let’s jump right into a Big Ring and teleport to the land of Bad Ports, a super-secret level that Sega has mastered ever since carrying their intellectual property across multiple systems, especially in terms of handhelds. Before getting into the games themselves, allow me to offer any and all additional perks you get alongside your four Sonic games. 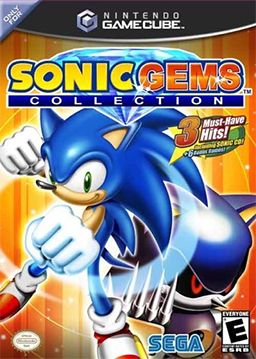 Other popular Sonic compilations like Sonic Mega Collection and Sonic Gems Collection feature tons of extra incentives for loyal players, whether it be in the form of secret games, tons of old comic book issues, old videos, full-color manuals… None of it really mattered in the long run, but there’s no denying it was there to give each compilation the extra touch it needed to be special. Sonic Classic Collection is extremely bare-bones, offering only pitiful illustrations and absolutely no unlockable content for accomplishing anything in-game. But that’s fine. I didn’t rush to the store to buy this game at full price to play Flicky, Ristar, or Sonic’s meager selection of Game Gear titles. I rushed to buy this game because I figured four to six perfect ports on a handheld would be well-worth the price of admission. 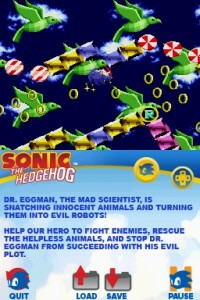 And they sure did try to sell us on the fact that most of the old games like Sonic the Hedgehog and its sequel had a newly implemented save-game engine where you could “save anywhere”! Unfortunately though, the ports were very far from flawless. For starters, they scaled down each of the more advanced titles to only include the one-player mode and no Options screens. So you don’t want to include a multiplayer mode for wireless fun? 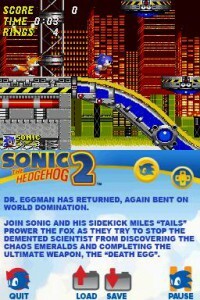 No helping out a friend as Tails or competing in the four 2 Player levels of Sonic the Hedgehog 2? I can forgive that, I suppose. But this meant no messing around with the Sound Test to play with cheat codes like the Level Select and Debug Mode like I used to do when I was small. I can understand excluding the multiplayer options of Sonic the Hedgehog 2 and its sequel, but… no Sound Test? No Competition mode that features four tiny bonus levels? There’s never a need to scale back to this much of an extent for a port of several 16bit games on a system more than capable of handling it, right? At least, I thought the DS was capable. One of the game’s major flaws is the fact that the original DS family of systems seems to bring about an unacceptable lag in almost all the playable titles. It was definitely noticeable enough to cause a stir in early adopters. 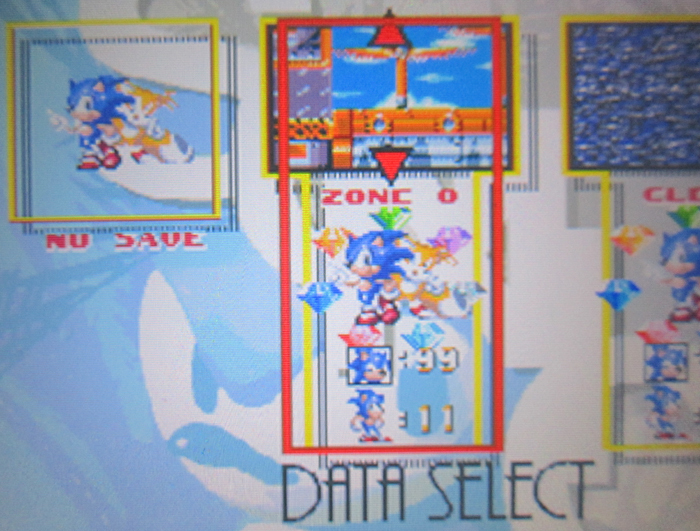 The special stages inSonic the Hedgehog are infamous in this collection for being slow, clunky, and nausea-inducing. A laggy Sonic leads to poor impressions and the ruination of some of my favorite games of all time. No, you don’t have to adjust your browser. That image is exactly as it appears: the “No Save” text is cut off, and what should read “Zone 8” effectively reads “ZONC 0”. All of the games in this collection are riddled with these tiny little inconsistencies (in graphics, sound, and each game’s engine alike) that add up to nothing more than a lack of quality control on Sega’s part. It’s like Sega hired a group of run-of-the-mill programmers off the street and tasked them with throwing together this compilation because they knew people like me would be there day one. It doesn’t have a tenth of the charm of collections like it, and it reeks of laziness. Heck, the lead developer for this collection, Stephan Dittrich, designed a homebrew Sega Genesis emulator that could run on R4 Flash Cards before mysteriously popping up in this collection after several years of radio silence. The R4 can easily run every game in the collection besides Sonic 3 & Knuckles, but an official release can’t? Are you kidding me? But…mediocrity aside, all six of these absolutely outstanding games are perfectly playable. 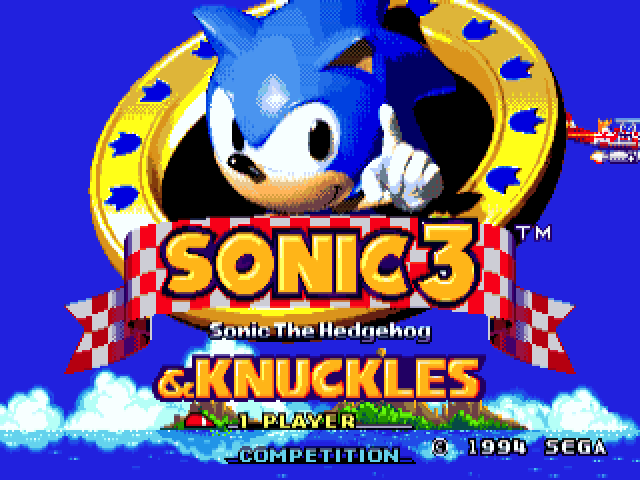 The save-game engine works to a fault (only allowing you to resume from the last zone you played, not from “anywhere” as advertised), and it is the only way to experience Sonic 3 & Knuckles on a portable collection. I put a ton of time into each game offered, and (most importantly) the price has dropped considerably from its original $35… So I can’t fault this little collection too much. If I had been tasked with something like this when the game first came out, I would have warned you to avoid this collection like the plague. 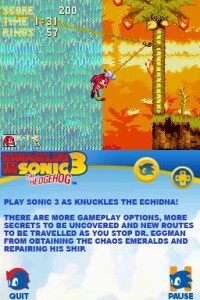 But now that it’s had some time to fall in price (and admittedly grow on me), I’ll admit I can recommend this game to a small niche of folks: the diehard Sonic fan that can forgive a series of hiccups in their favorite games, or someone who’s never encountered the classics before and enjoys gaming on the go. They’re all here, and they’re all playable. I suppose that’s what counts, right? At least it’s not Sonic the Hedgehog Genesis (GBA). 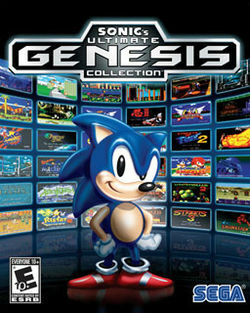 Sonic Classic Collection is more about the “classic” and less about the “collection”.